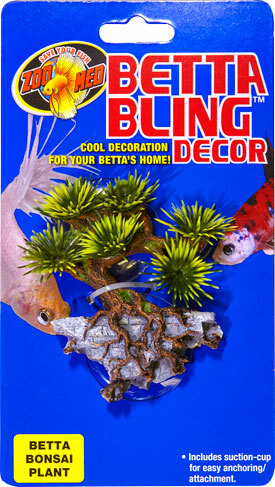 Betta Bling™ Decor – Bonsai Plant | Zoo Med Laboratories, Inc. Cool decorations for your Betta’s Home! Give your Aquarium some style with Zoo Med’s Betta Bling Decor. Includes suction-cup for easy anchoring and attachment. Several varieties to choose from, including: Mermaids, divers, Tiki, and aquatic flora.